One of the current positions we’re recruiting for is titled Outdoor Education Adjunct Instructor. It’s a job we imagine would appeal to anyone who loves working in the outdoors, especially with diverse adolescents from backgrounds that haven’t afforded them the opportunity to experience the healing and generative nature of the outdoors or a unique and supportive community like ours. Not a lot of classroom time required here. In fact, most of the job requires extensive time with underserved youth in the open air, surrounding by mountains, meadows and meandering streams. And while that admittedly sounds like an outdoor professional’s dream, there’s a ton of administrative prep work involved in this position. For instance, just preparing for the Eagle Rock School New Student Wilderness Orientation Course begins with planning and coordination among various Eagle Rock team members in the areas of logistics, instruction and course directing. There’s also the task of assisting with the complex technical components of adventure-based classes — again including logistics support. In addition, there’s equipment and food inventory, activity risk management and training, climbing wall training, curriculum development, and assisting us with our ongoing accreditation documentation through the Association for Experiential Education (AEE). Oh, and then there’s a solid amount of time spent with our veteran students and other staff members in our residential school setting. Still interested? If you’re excited by the notion of facilitating outdoor education experiences for diverse students ages 15-17, this job might be right for you. The successful applicant, depending on their particular skill level, will deliver instruction from a number of options, including rock climbing, mountain biking, canoeing, Telemark skiing and hiking. The idea is to create ways to engage our students through outdoor and backcountry-based experiential education — something that can’t be done in a traditional classroom setting. Our new Outdoor Education Adjunct Instructor will also participate as an integral member of one of our on-campus student homes, including working as part of a house team. That’s going to entail some evening and weekend duty, along with community meetings, service projects, in-house assignments and pretty much being an active role model and participant in the Eagle Rock community. There’s a lot of supervision and again, paperwork involved in this position. And while the position does entail that administrative work, it’s hard to imagine a more rewarding outdoor education job. Eagle Rock is unique in that our wilderness program is an integral part of the school, rather than a short-term experience or an add-on. Working at Eagle Rock, you will form deep and lasting relationships with the students on your courses. From a logistical standpoint, you’ll manage outdoor education equipment such as camping gear and bicycles; and, make repairs and maintain the Eagle Rock wilderness shed and climbing wall. There will be hours spent checking equipment in and out, coordinating food inventory and purchases for wilderness outings, supervising student chores crews and keeping a close watch on department resources. First, submit a brief cover letter to your resume, along with a self-assessment that references the responsibilities mentioned on the official job posting on the Eagle Rock website (see: http://eaglerockschool.org/about-us/employment/). Submit a list of three professional references with phone numbers and email addresses. Send these materials by email to: info at eaglerockschool dot org. If you have a clarifying question, please email it to Jesse Beightol, Eagle Rock Outdoor Education Instructional Specialist at: jbeightol at eaglerockschool dot org. Please note: We only accept electronic submissions, so please don’t call us or submit paper or faxed materials. We’re hoping to find the right applicant by August or September of this year, so our application deadline is April 29, 2016. We’ll be holding phone interviews between May 2 and May 6, and onsite interviews will be conducted May 9 through May 20. These deadlines are not set in stone, and we’re flexible when it comes to working around previous commitments (like existing work in the backcountry) for those we consider to be the best candidates. Having said that, we intend to stick to our timeline to the best of our ability. If this sounds like the job of your dreams — or perhaps you know someone who you think would be a perfect fit — gather up your resume and references and perhaps we’ll get the chance to meet you in May. Eagle Rock does not discriminate on the basis of gender identity, race, ethnicity, religion, sexual orientation, or disability. Eagle Rock proactively seeks a diverse workplace and therefore members of racial/ethnic minorities and other protected classes are encouraged to apply. 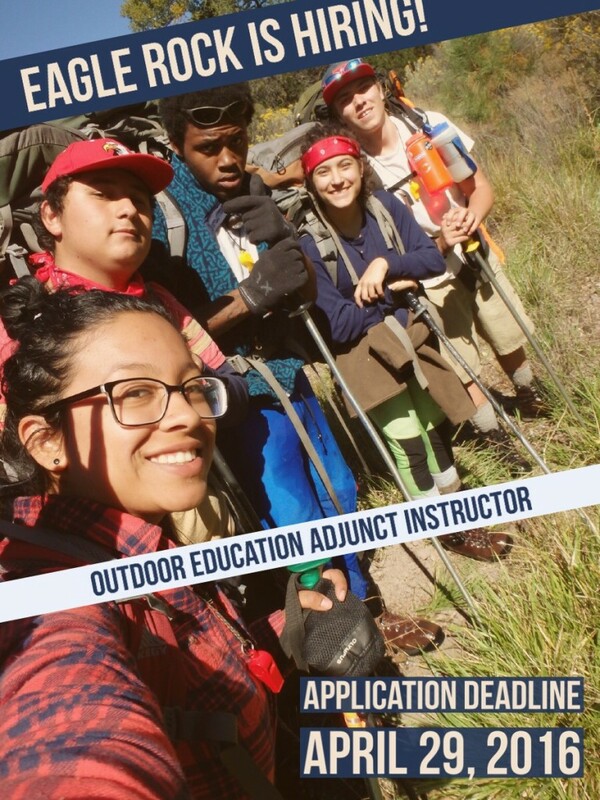 This entry was posted in Employment Opportunities and tagged Association for Experiential Education, New Student Wilderness Orientation, Outdoor Education.